All the big stars, i.e. those with a mass exceeding the sun’s mass by a factor of 1.3, gain most of their energy by a hydrogen-fusion reaction that involves a catalytic cycle, known as the Bethe-Weizsäcker or CNO-cycle. During this reaction cycle, protons (i.e. hydrogen nuclei) are added four times into a cycling reaction that converts carbon through various nitrogen and oxygene isotopes back to carbon, while releasing helium as the net reaction product and, of course, the enormous amount of energy which fuels the star. This cycle in its logic resembles the citric acid cycle, during which all aerobic organisms convert energy from nutrients (i.e. carbohydrates, fat, and sometimes proteins) into ATP. 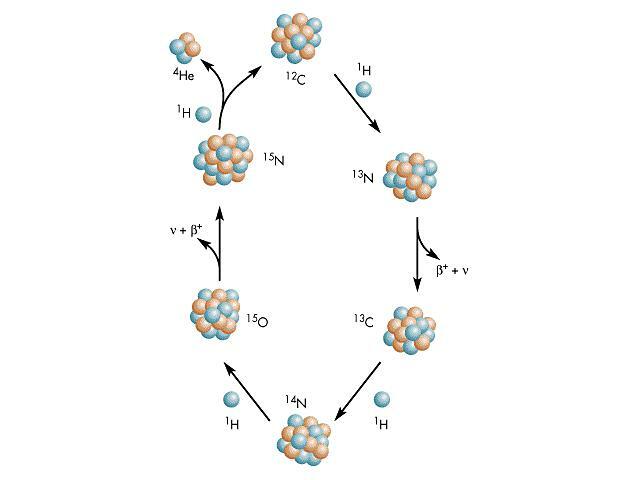 Similar to the Bethe-Weizsäcker cycle, successive transfer of protons (in this case released from water) are an important feature of this energy conversion. But beyond this similarity in the reaction cycle, the CNO-cycle (providing stars with their enormous energy) and the citric-acid cycle (providing energy to living organisms) are connected by a much more fundamental link: The Bethe-Weizsäcker CNO cycle is the first reaction in the formation of our universe that produces Oxygene and Nitrogene from Carbon and Hydrogene (Carbon is directly produced by 3-alpha fusion of Helium nuclei). And it is these three elements, namely Carbon, Oxygene, Nitrogene and Hydrogene, that are the basic elements of all living matter. All Carbohydrates are made of C, H and O, as are all fatty acids. All proteins are made of C, H, O, and N (with a trace of Sulphur). And essential element that is missing is Phosphorus, an integral constituent of DNA and RNA. But in molar amount, it is much less than C, H, N, and O. So we have to acknowledge that the main constituents of our body (and of any other living organism as well) were a by-product of the stars engine. And everywhere was song and celebration. Ghazal, my Dear, I always believed that you came from another star. What you wrote above shows that you brought from there some interesting ideas with you. PS: I think we also have something in common, in our dialogue that is going on for about 3 years now. Whereas I always tried my best to misunderstand you, to fill the empty spaces in your messages with a meaning that perhaps was never there, you in contrast always managed to not understand anything from what I wrote. When I imagined that there are words between the empty spaces in your letters, you decided that the long sentences from me were void of any meaning. How long can this go on ?